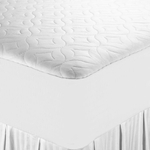 The Economy Choice Quilted Fitted Mattress Pads are a good choice when faced with a tight budget. 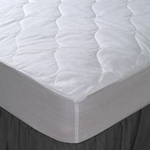 The Economy wholesale mattress pads have 5 ounces of down-alternative polyester batting per square yard with an onion pattern quilted polyester top and bottom. A 12" non-woven polyester skirt with an elastic band ensures these fitted pads will stay in place. 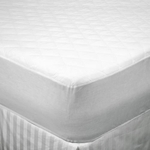 Do you need wholesale mattress pads shipped quickly? The Value Choice Poly/Cotton Mattress Pads are available when you need wholesale mattress pads in a hurry due to an approaching deadline.